Sweet potato is not a potato or a yam, it’s the tuber of a plant that is part of the morning glory family. Its origins have been traced to the Americas and Polynesia, and throughout the centuries it has made its way across continents and oceans, many a time coming to the rescue in times of famine both because its ability to grow in the less ideal climates and its nutritional value. In Hawaii, there are two main families of sweet potatoes being grown and enjoyed: the Hawaiian varieties and the Okinawan varieties. The Hawaiian varieties are currently being researched, conserved and revived. ‘Uala is one of the main “canoe plants” or one of the possibly 30 agricultural plants brought by the first voyagers to the Hawaiian Islands. It is thought to be one of the central foods, growing where taro could not grow. Like taro, the master cultivators of old Hawaii, developed hundreds of varieties of sweet potato, adapting and selecting to match climate, taste and color preference, and use. The Okinawan variety was established in Hawaii in gardens of plantation workers immigrated from Okinawa and Japan. 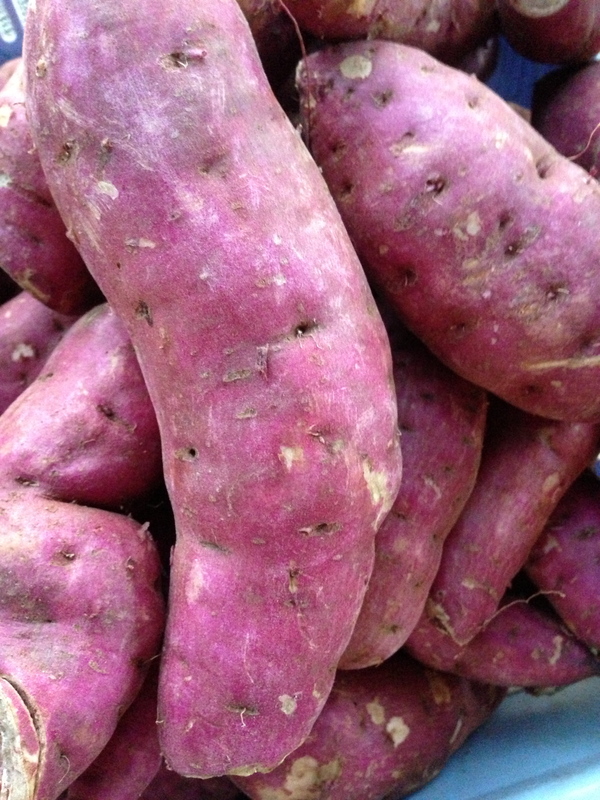 This strain of sweet potato was originally brought first to Okinawa from Fujian province in China, cultivated well there and became a staple, often rescuing villages from famine because its ability to survive typhoon and other weather extremes, and oceanic soil. It was later introduced to the court in Satsuma, Japan and proceeded to take hold there, hence the moniker Satsuma Imo for the orange flesh variety found traditionally slow roasted on hot pebbles in Japanese cuisine. 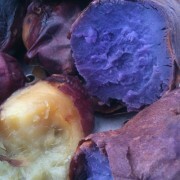 Okinawan Sweet Potatoes are most commonly thought of as the purple fleshed sweet potato. Sweet Potato Sprouts or Greens The young sprouts and greens of the sweet potato have always been enjoyed in dishes. Only recently has it garnered attention is the food for the 21st century — studies have shown that the greens are high in protein and other phytonutrients – living up to its old reputation as a famine rescue food. – Always wash your sweet potatoes well before cooking. Scrub with veggie brush too if you like to eat the skin. – Sweet potatoes can be steamed, baked (most wrap in foil to do this), roasted, fried, boiled, and pressure cooked. – Sweet potato leaves can be sauteed, added to soups and stews. You can treat this leafy green as any other leafy green. Selecting and Storing Tips Select potatoes free of too many blemishes, soft spots and sprouting. Store in cool dark areas, like other tubers. Select sweet potato leave that are free of yellowed leaves, blackening or wilt. Store unwashed in plastic bag in refrigerator for up to 3 days.